Me as Lady Gaga, Halloween 2010, at a time in my life when I didn’t really know who I was. Imagine not knowing who you really are. Never really having a strong sense of self or identity. Changing, sometimes on a conscious, but often on an unconscious level, to adapt to the person you are with in a given moment. Sure, most people behave a bit differently around different people, for example, you’d expect someone to be more reserved and professional around their boss and much more at ease and free with a loved one. But, imagine if your personality shifted like a chameleon depending on whose company you were keeping in a given moment. Imagine if the “sides” of you were so extreme that you wouldn’t know how to behave if you ended up in a room filled with all of the people you know. In 2010, during an intensive outpatient hospitalization, this was my story. 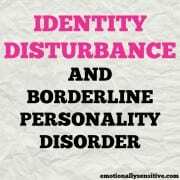 Upon revealing it to my psychiatrist and looking at the other criteria of Borderline Personality Disorder (BPD), my accurate, final diagnosis was finally confirmed, and Identity Disturbance is the term that I learned was the cause of this particular issue. As someone who has always been an emotionally sensitive person, and who grew up in an invalidating, often abusive and sometimes neglectful environment, I developed a deep need for the approval of others. I didn’t just want other people to like me. I needed then to like me. As a young child, my life depended on it. I needed to have my parents’ favor in order for them to not harm me and to take care of me when I needed them to do so. As I grew older, and my life no longer depended on others liking or caring for me, this behavioral pattern stayed in place, and so did the mindset that I didn’t have the resources or ability within to take care of myself. The story gets much deeper, of course, but suffice to say that it was a difficult, often exhausting way to live, and for many years I didn’t realize that I had any alternatives. So, I would go about my life, changing and adapting all parts of me to please others, win their favor, and to feel loved and accepted, because the opposite, to displease others, have them not like me, and to feel rejected and abandoned, was way too much to bear. As a young adult, my sense of self was pretty much non-existent. Other than my core personality traits of being kind, empathetic, and caring, and knowing that I love to write and sing, there really wasn’t much else that wasn’t up for grabs in terms of my willingness to be flexible and completely change to become what I thought someone else wanted. New boyfriend likes electronic dance music? Watch me: find out EVERYTHING there is to know about the most popular EDM DJs, the best internet stations to stream, learn all the lyrics, and then EDM becomes my favorite too… even if there is this tiny little feeling inside that “I don’t really like this. I find it irritating” or “The rate of the beat makes me feel anxious.” No. I am what he needs me to be. I denied that tiny voice inside that had been so repeatedly denied and squelched throughout the years. I was used to it. I was numb. I just became who I wanted others to be. Over and over and over. Even my religion. Sexuality. Political affiliation. Career path. Majors in college. Geographic location. You name it. So, how did I begin to shift from the patterns of identity disturbance to discovering who I really am, apart from everyone else? How did I stop living in the terror of being alone and rejected because I didn’t live up to others’ standards? How did I even begin to actually love myself and stick to my values no matter who is in my presence? The short answer is, after my diagnosis of BPD, I was introduced to something called Dialectical Behavior Therapy (DBT), and learning, practicing, and routinely turning to the skills helped me to reclaim, or perhaps for the first time actually CLAIM, my life. Because I experienced a powerful transformation beyond my expectations, I began to create meaning from my past pain by teaching DBT-informed online classes to other emotionally sensitive people around the globe, where I talk about my journey and the many things that helped contribute to my progress. Doing so allows me to encourage countless others to potentially reduce some of the unnecessary suffering that they might otherwise experience, and I am so humbled to be a part of each student’s individual, precious journey. Hearing someone share that they realized that they have been doing XYZ for years because they thought it would please so-and-so, and not because doing XYZ actually gave them any sense of joy, fulfillment, or felt like it was what they wanted to do, is always amazing. Sometimes, people are doing a few things to please others, be enabling, or co-dependent, that’s not necessarily identity disturbance. I love seeing both types of epiphanies though – both those who don’t directly relate to identity disturbance but want to be more assertive and healthy in relationships (and less people-pleasing), and those who are coming to terms with a deep need and desire to build their sense of identity, now, as adults. I smile brightly at this a-ha moments of self-empowerment that happen all of the time. Sometimes people are just incredibly relieved to feel heard — to know that someone else has felt this way and has managed to overcome and move forward in life. Sometimes the validation that can come with the dialectical discovery of “there is a reason I’m like this and I can change” can be a catalyst for deeper work with their therapist or other mental health professional. If you can relate to issues of identity disturbance, know that you are not alone, and that people can and do get better. It takes a lot of work, and proper psychiatric treatment from a qualified mental health professional is the first necessary course of action. You may then find that learning skills in a supportive, encouraging, non-judgmental environment with others who are and have been there can be helpful on the journey, too. You can do this! If you’re interested in learning more about me and taking my online classes from anywhere in the world, please click HERE.